Cy Twombly in Mr. Morgan’s House? Among other trends I deplore in Who Says That’s Art? is the postmodernist artworld’s growing incursion into institutions devoted to world-class private collections of the past. Such incursions—in clear violation of the founders’ tastes—are achieved by directors and curators bent at all costs on introducing “contemporary art” (a deceptive term encompassing only anti-traditional, “avant-garde” work). They could not do so without the complicity of trustees, however—some of whom collect such work. Still worse, financial support for exhibiting this work of dubious artistic value often comes from the dealers who trade in it. Cy Twombly: Treatise on the Veil [more], which closed last week at the Morgan Library & Museum, is symptomatic of this lamentable trend. So much was wrong about it that I hardly know where to begin. I’m hard pressed to say which is worse, for example—the execrable work? or the inane curatorial glosses upon it? The show’s featured work was Twombly’s “monumental” Treatise on the Veil—a 33-foot-wide expanse of gray house paint, relieved only by a strip of thin white lines. “Monumental” properly refers to more than mere size, however; it also connotes importance—significance. The significance of Cy Twombly (1928-2011) we’re told, is as “one of the most important artists to emerge in the wake of Abstract Expressionism.” What is his work noted for? Its “rich repertoire of marks, scrawls, scribbles, doodles, and scratches”—a contradiction in terms if ever there were one. 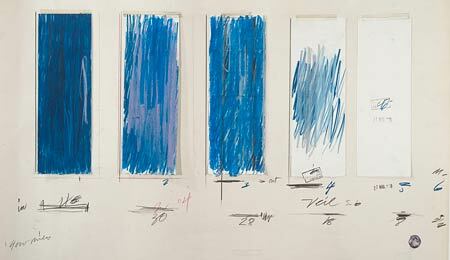 [Twombly’s] folded strips, . . . smudges, and illegible scrawls create a rich and layered surface and reveal the artist’s pleasure in the process of making. Note, for instance, the use of different kinds of tape [used to fasten the folded strips]. I’m tempted to add: I’m not making this up—cliché though it may be. The introductory wall text for the Twombly exhibition informed visitors that Treatise on the Veil was inspired by a “musical” piece entitled The Veil of Orpheus, by the French composer Pierre Henry. If you fail to discern the “increasingly lyrical feel” the Morgan curator imputed to Twombly’s work, never mind. You won’t hear it in Henry’s musique concrète either. Twombly’s “marks, scrawls, scribbles, doodles, and scratches” may be Dervaux’s idea of drawing, but they were surely not Mr. Morgan’s. The trustees of the Morgan should hang their heads in shame at this latest travesty of his legacy. Note: For an appreciative review that outdoes in inanity even the Morgan curator’s glosses, see “Cy Twombly’s Remarkable Treatise,” Hyperallergic, December 21, 2014.